(In case there isn't enough asparagus in your wardrobe). 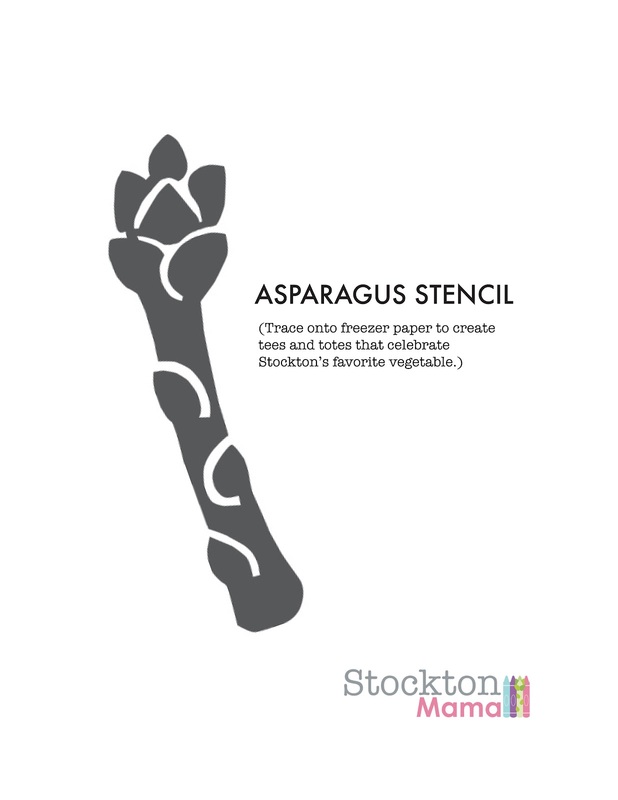 With Stockton's Asparagus Festival coming up quickly, I thought it might be fun to stencil up a T-shirt and a tote bag in celebration of our town's favorite vegetable. True story: One year - the year we moved here, I think - my husband came home from the Asparagus Festival with a shirt that said, "California's Stinky Pee Fest, Since 1985." Subtle! These will be way classier. Easy too. I used bleach for one and fabric paint for the other. 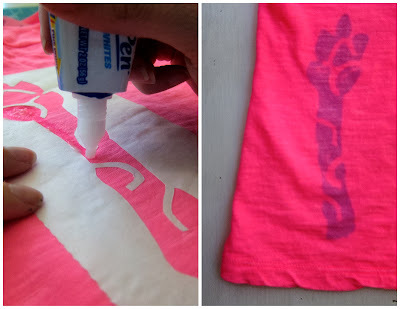 You'll need: A T-shirt, a bag or something else to stencil on; asparagus stencil (download below); craft knife or sharp scissors; pen or marker; freezer paper (I found mine at the grocery story, near the aluminum foil); an iron; fabric paint and brush or a bleach pen. We'll start with the bleach version. Step 1: Trace your stencil onto the flat, paper side of the freezer paper and carefully cut it out. Then decide whether you want to use the positive or negative image of the asparagus. I made test strips to figure out which I liked better. Step 2: Place the freezer paper stencil on your shirt, plastic side down. 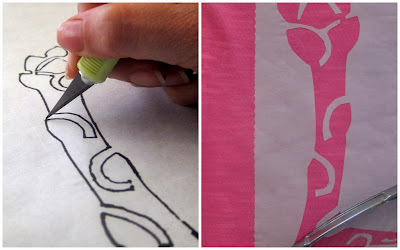 Press it with an iron on medium heat, one small section at a time, until the stencil adheres to the fabric. 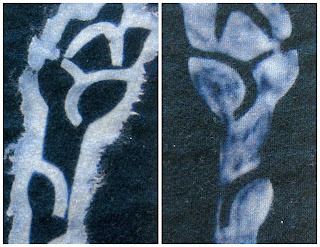 Try to avoid running your iron back and forth over the paper - this stencil has some small pieces that will crumple if you do. Instead, just apply even pressure. Step 3: Place something - a piece of cardboard, for example - in between layers of fabric to prevent the bleach from bleeding through. I used an old magazine, wrapped in a piece of freezer paper. 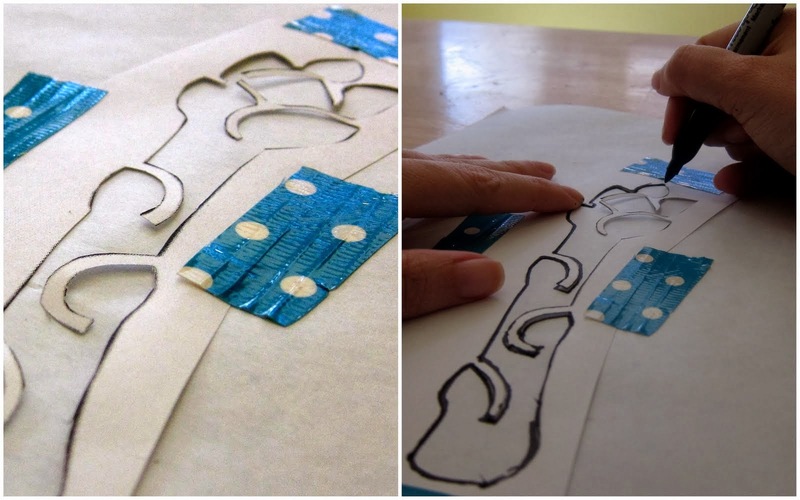 Step 4: Using the fine point of the bleach pen, apply a thin layer of gel to the areas you want to lighten. 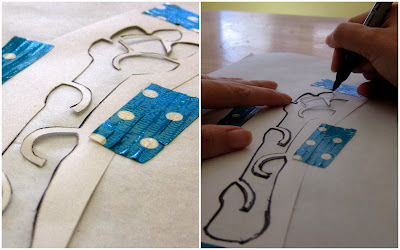 Especially near the edges, you'll want to avoid saturating the fabric. The freezer paper doesn't adhere as well when it's too wet, and your edges will lose some sharpness. Step 5: Set the shirt aside and check it every few minutes to see how the color is developing. When it's as light as you want it, peel off the stencil, rinse the shirt in water and then wash it in the laundry machine (I washed it with whites to be safe). For the fabric paint version, follow steps 1 through 3. 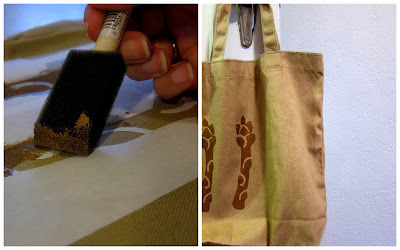 Then use a brush or sponge to apply paint to your fabric. Again, you don't want to get too heavy here. Remove the stencils when the paint has dried completely. Here's the stencil (Click to enlarge). I'd love to see what you come up with!